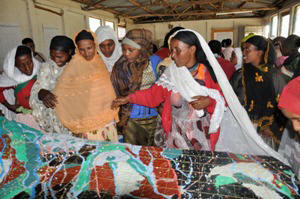 This 1:12,500 scale (2 x vertical exaggeration) Participatory 3D Model (P3DM) of the districts of Dinsho, Sinana, Goba, Agarfa and Adaba , Bale and West Arsi, Oromia, Ethiopia was completed over the period January 10 – February 15 2009. 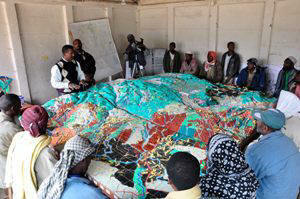 The model measures 3.6 x 2.8 m or 1575 km2 on the ground and has been the 1st P3DM constructed in Ethiopia. The exercise took place in an area where MELCA-Ethiopia has been active for a long time, with the objective to plan out the sustainable management of the area, revive local bio-cultural diversity and support local environmental education. A total of 72 representatives from 24 Kebele (3 from each Kebele) from the districts of Dinsho, Sinana, Goba, Agarfa and Adaba attended the exercise. 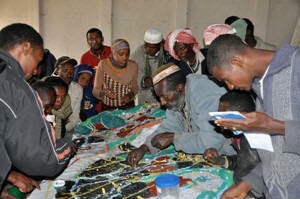 Participants included traditional leaders, elders, farmers, men and women, and youth. Under the guidance of MELCA-Ethiopia director, Dr. Million Belay, students from the Dinsho Elementary and High Schools assembled the blank models (3 units 1.2 m x 2.8 m each). Knowledge holders populated the model with their memories and reconstructed the present landscape. Trainees included representatives from the Frankfurt Zoological Society, the Bale Mountain National Park and MELCA staff. This exercise has been made possible by the coordinated effort made by MELCA, the Frankfurt Zoological Society, SOS Sahel and Farm Africa. This exercise has been a follow-up to the regional P3DM training organised by CTA and ERMIS-Africa in Nessuit, Kenya in 2006 where a number of Eastern Africa delegates from NGOs and CBOs were trained in organising and conducting P3DM exercises. 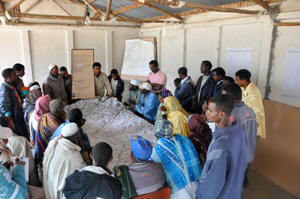 Dr. Belay attended the training and put acquired skills into practice in replicating the process in Bale. MELCA- Ethiopia or ‘Movement for Ecological Learning and Community Action’, was founded in 2004, to work for the conservation of ecosystem and for the revival and enhancement of Traditional Ecological Knowledge and to protect the rights of communities in Ethiopia through research, advocacy, endogenous development and intergenerational learning. The word ‘melca’ means ford both in Amharic and Oromo language – two of the widely spoken languages of Ethiopia. It means a crossing point on a river, which is symbolically used to indicate the need to take people away from their misconception about local people and culture to an understanding and appreciation of traditional ecological knowledge. A river also signifies linkage with a source. If the source dries, the river also dries. MELCA emphasizes that culture is the source of identity and wisdom, and that the destruction or degradation of culture will result lose of a vast amount of knowledge and identity. MELCA works with local communities, elders, schools and youth in the Sheka Forest region in southeast Ethiopia, the Bale Mountains National Park, and Menagesha Suba forest near to Addis Ababa. MELCA is also a regional node for the African Biodiversity Network.